The PASSPORT Vintage storefront adds an extra charm to First Street. 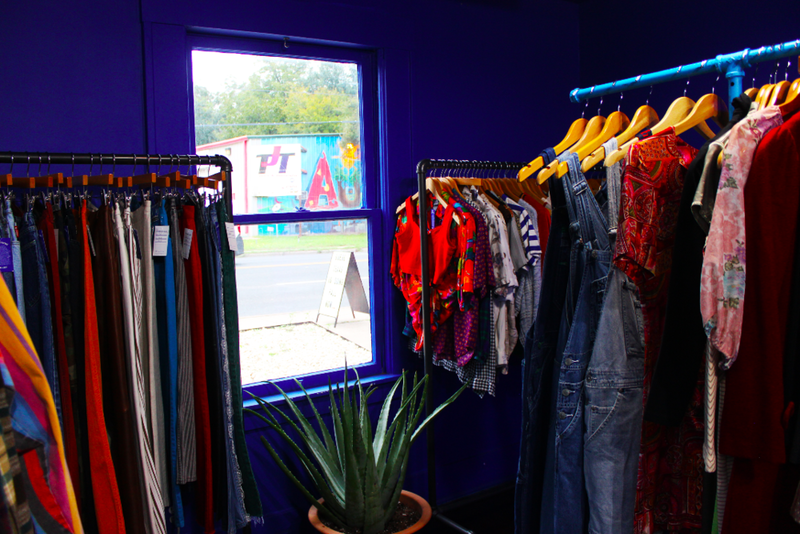 Inside a little blue house on South First Street, you will find a gem of a shop known as PASSPORT Vintage, co-owned and co-operated by Maria Oliveira. Her warm smile and unique style welcomes customers into her shop filled with the smell of wooden incense. The blue lights and curtains complimented the wooden floors, while the racks of vintage clothes were organized along the walls of the two rooms in the house. A painted mural welcomes customers and encourages them to come back again. Now at 31, Oliveira successfully owns three businesses while also managing other projects she’s passionate about on the side. What is now known as PASSPORT Vintage originally started on Etsy as Oliveira’s side hustle while she was working at American Apparel. Her part-time earnings were about $400 per month, so she decided to commit full-time in 2014 to double those earnings. Inside the store, curated vintage items hang on the racks. While her experience at American Apparel set her up with the skills for her career, her immigrant experience that is deep in her bones and her work ethic led her on the path to be an entrepreneur. Oliveira said initially, running her Etsy store was quite easy compared to managing 14 stores, but Oliveira didn’t stop there. She tackled Instagram, modeling and creating consistent content to keep her audience interested. After three months, her Etsy store earned her a full-time income and eventually led to a brick and mortar store after a year and a half, Oliveira said. PASSPORT Vintage carries both clothes and accessories. The lack of vintage markets in the Austin area inspired Lerma and Oliveira to tackle on another project now known as Laissez Fair in April 2018. This biannual event hosts 20+ vendors selling vintage womenswear, menswear, home goods and jewelry. Through Laissez Fair and PASSPORT Vintage’s social media accounts, event planning and marketing, Oliveira discovered her passion for marketing and strategy which ultimately led to her third business: Fresh Bread, a social media consulting company. Her current client, Cristina Tzintzun Ramirez, founded Jolt Texas and Workers Defense Project. Oliveira was also working with Jolt until they hired a full-time employee. Her love for marketing grew as she began to understand the importance of getting your message across as a business, if done right. PASSPORT Vintage shows versatility in their collection, carrying clothes for all seasons and occasions.